Shoulder Pain. What can I do? Your shoulder complex is comprised of four joints, which are made up of three bones (upper arm bone, collar bone and shoulder blade) and the surrounding muscles and ligaments. 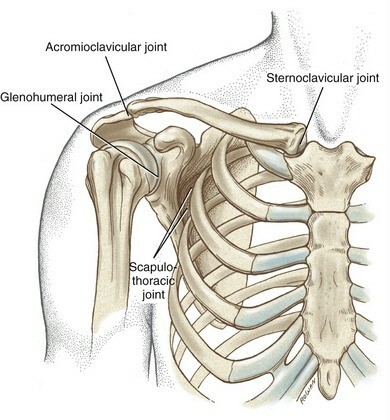 All four joints in the shoulder complex are required to work together in order to provide full mobility. That being said, any pathological alteration in any of these joints can cause decreased mobility, pain, stiffness etc. in the whole shoulder complex. Because of the shoulders proximity to the neck; it can also be easily affected by any injuries in the neck as well. Why you should not avoid shoulder pain? Pain in shoulder can range from quick intermittent pain to deep constant aching pain going down in the arm. Reasons for shoulder pain could be many ranging from everyday wear and tear, lack of exercise, poor posture, overuse injuries and direct injuries. If you are having pain, for any reason, it will cause you to compensate for the pain, develop poor postures and disuse the painful muscles. This will lead to further weakness and deterioration of that muscle. This makes your shoulder more susceptible to other injuries as well as prolonging the original injury. How can Physiotherapy help in Shoulder pain? A detailed Physiotherapy assessment which will involve assessing range of motion, strength, posture evaluation, special testing etc. will let you and your therapist know more about your pain and the plausible cause for it. Further, your Physiotherapist will outline a treatment program, which will focus on treating current symptoms and avoiding them in future. What will Physiotherapy treatment involve? Depending on your condition, a Physiotherapy treatment will be tailored uniquely for you. Treatments that are typically provided range from managing acute symptoms like pain and swelling with physiotherapy modalities to increase range of motion and strength with hands-on treatments such as manual therapy, muscle energy techniques, muscle release, exercise prescription etc. When appropriate, your physiotherapist will provide you with a suitable home exercise program. Typically the first session with your physiotherapist might last about an hour, and subsequent visits should range from about 30-45 minutes.